An explosion of colour non stop from mid winter to May. A new colour blens and the best Polyanthus around; prolific in flowering displays & fully winter hardy. Supplied as 20 Garden Ready Plants, large enough to plant straight out in autumn. The latest colour blend, and the best Polyanthus around; a Multiflora variety and therefore incredibly prolific in flowering displays, fully winter hardy and will flower non-stop from midwinter through to late May every year. Height 25cm (10). Easy to grow, they work best in sunny or lightly shaded spots in tubs, baskets and planters, or the front of garden borders. Supplied as 20 garden ready plants ready to plant straight out. 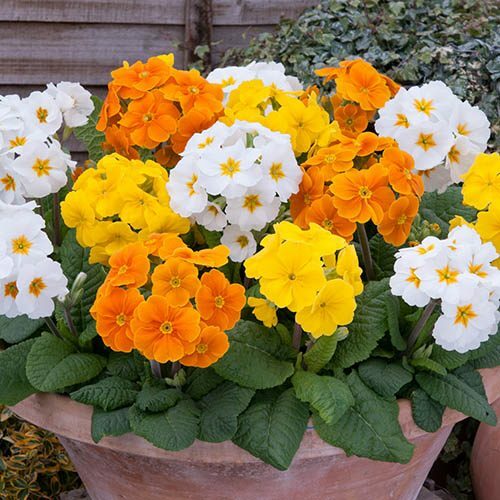 Polyanthus plants enjoy moist, well-drained soil. For best results, plant out from mid-July to early October.